Location: Frodsham, Cheshire in England. Condition: Site now occupied by a larger house. 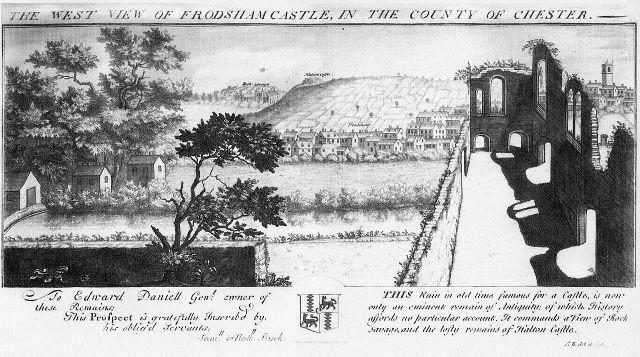 Notes: Frodsham Castle was in the market town of Frodsham, Cheshire, England (grid reference SJ514775). Initially it served a military purpose, it then became a manor house and a gaol. After being damaged in the Civil War it was replaced by new house, Park Place. The ruins were bought by John Daniels of Daresbury and then in about 1750 by Daniel Ashley, a local solicitor. His son, Robert Wainwright Ashley, who was also a lawyer, demolished the ruins and built a house, Park Place. Part of the foundations of the castle formed the cellars of this house. The site is now occupied by a larger house, Castle Park House which is owned and administered by Cheshire West and Chester Council.